If you want to join me, I have 100 tickets available for just £10. It’s first come first served for my fans, so be quick. (Reuters) – Yohan Blake and a speedy Jamaican 4×200 metres relay team did not need Usain Bolt to add to the island nation’s collection of world records on Saturday. 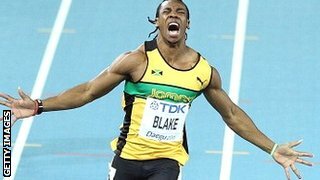 Blake, the world’s second fastest 200 metres runner behind Bolt, turned on the jets and anchored Jamaica to a world record one minute, 18.63 seconds at the inaugural IAAF World Relays in the Bahamas. The sizzling performance took 0.05 seconds off a 20-year-old record held by a Carl Lewis-anchored American team in 1994. “We knew we could come here and get this medal and world record,” said Blake, whose training partner Bolt holds both the 100 and 200m world records and Olympic titles but has not run this year. “It feels very good enough I think that we could have gone faster,” added 100m Olympic silver medallist Blake. “KINGSTON, Jamaica — Yohan Blake and Shelly Ann Fraser-Pryce headline a powerful Jamaican squad to the inaugural IAAF World Relays scheduled for The Bahamas between May 24 and 25. However, as expected, the world’s fastest man, Usain Bolt was not selected by the Jamaica Athletics Administrative Association (JAAA) for the event that also serves a qualifier to the 2015 World Championship. Bolt has not run all season and last week he indicated in a Jamaica Observer story that his participation was dependent on his coach. The full team will be announced after this evening’s JAAA executive meeting at 5:00pm with Jamaica set to participate in all the relays except the 4x1500m events. Read more at The Jamaica Observer. “In front of nearly 10,000 people on Manchester’s main drag, Yohan Blake matched his electric pink outfit with a high-wattage run – and then gave the strongest indication yet that he will compete at this summer’sCommonwealth Games in Glasgow. “I’ve been wanting to play for Yorkshire or in England. After running, I’ll put my mind to that,” Blake told BBC Radio 5 live. A club spokesman added: “At this stage, we’re flattered that Yohan has expressed an interest in being involved and playing with Yorkshire. We’re always on the lookout for fresh talent. 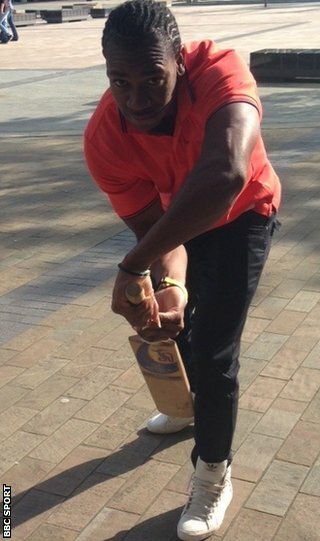 Blake plays for Kingston Cricket Club when the athletics season is over and claims he could be the world’s fastest bowler – regularly reaching speeds of 85-90mph when he is practising. Nicknamed “the beast” for his quirky pose before races, he took silver behind compatriot Usain Bolt at London 2012. He plans to retire from the track at 29 and switch to cricket, though he joked he is already “good enough to make England’s team”. Bolt has also talked of switching sports after hanging up his track spikes, saying he “has the skills” to play for Manchester United, while the coach of the Jamaican national football team, Winfried Schaefer, isreportedly interested in using the world’s fastest man. Yorkshire, however, could face competition for his signature, with Australian side Sydney Sixers previously expressing an interestin his services. “If he can do what he says he can do – and I have no reason to disbelieve him – Yohan would be a marquee player for me to sign,” said Sixers chief executive Stuart Clark. Athletes are often obsessives, clinging to the comfort of a repetitive routine like a warm, cosy blanket. It perhaps explains why Yohan Blake listens to Michael Jackson over and over again. Time after time. Day in, day out. But on closer inspection, deeper reasons emerge as to why the King of Pop has had such an influence on the Jamaican sprinter who aspires to become the king of the track, and it is not just about the music. It is about emulating the singer’s wider vision of the world: wanting to make a change, to help those less fortunate than himself; to give them a chance, to give them hope. Admittedly, Jackson’s songs and dancing aren’t bad, either. Three years ago Blake, now 24, became the youngest 100m world champion in history, establishing himself as a potential superstar and as Usain Bolt’s only genuine rival for double sprinting gold in London 2012. As it turned out, Blake finished second to his friend and rival in both the 100m and 200m, but later that month went on to equal the second fastest 100m in history, 0.11 second slower than Bolt’s 9.58 world record. Injured for almost all of last season, the former world champion is fit again and determined to fulfil his potential. And driving Blake, the man nicknamed ‘The Beast’ by Bolt because of his relentless work ethic, is the desire to, like Jackson, have an impact beyond his immediate world. “I can moonwalk, of course,” he says with an indignant smile, though when asked to demonstrate his prowess he hides his face in his hands and laughs, pointing out that the gravel scattered on the ground would prevent him from gliding backwards. But there is no questioning Blake’s sincerity. This is a man who listens to Jackson’s music on a daily basis, who cried upon hearing news of hisdeath in 2009 and stopped training for a week. But, in many ways, it is Jackson’s actions away from music that has been the real influence. “He showed how people suffer and if you can start with the man in the mirror you can make a change,” the softly-spoken Jamaican explains. Blake grew up in one of his country’s toughest neighbourhoods in Montego Bay and his success has already brought considerable wealth. But he gives 5% of his earnings to charity and funds a boys’ home in Jamaica, providing education and psychological support to abused and under-privileged children. The double Olympic silver medallist started his YB Afraid Foundation a few months after he won World Championship gold in 2011. “He sees himself as the Michael Jackson of athletics,” says his manager, Cubie Seegobin, watching on as a group of Manchester high school students scream and cheer and giggle in the presence of his client. And Seegobin is open-mouthed in astonishment when, responding to the demands of his young audience, Blake removes his cap, signs it and presents it to an excitable girl who correctly answered that Blake won hisworld championship gold in 2011. Blake has often said his rise to the top was made without a “gold spoon”, but he knows there is still a long way to go. His first challenge, on the streets of Manchester on Saturday, is to better Bolt’s 150m world best of 14.35 seconds, set by the six-time Olympic champion on a rain-soaked Manchester afternoon in 2009. “I told him in training that I was going to try 14.30. He said, ‘That’s going to take some running’. He always sets the bar high, which I really like. As a youngster you have to aim high,” says Blake. Beating Bolt might be regarded as the definition of aiming high and Blake knows his fellow countryman is not departing the scene any time soon. That, however, just fuels Blake’s resolve. “I believe in time,” he says. “That everybody has their time. Usain Bolt is having his time. We train together and I respect him a lot. I’ll just wait until I have my time. You can watch Blake compete at the Great City Games Manchester on BBC One, BBC HD, and the BBC Sport website from 13:15 BST on Saturday, 17 May. “Jamaican sprinter Yohan Blake (150m), Olympic long jump champion Greg Rutherford (long jump), world indoor 60m champion Richard Kilty (100m) and world 400m champion Christine Ohuruogu (200m) are just some of the athletes who will be in action at the BT Great CityGames Manchester on Saturday.